Honey brandy originates from the regions occupied by Proto Slavs and it is considered one of the oldest beverages. 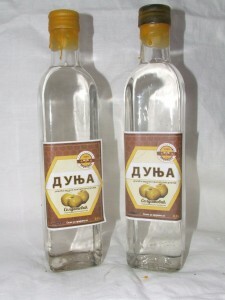 Honey brandy is a traditional natural drink. It belongs to the group of liqueurs and it has a therapeutic effect. Every bottle of brandy produced by the ‘Soldatović’ Estate is unique, since it is hand-filled and wax-sealed. It is made in a traditional way, according to a centuries-old Serbian method. 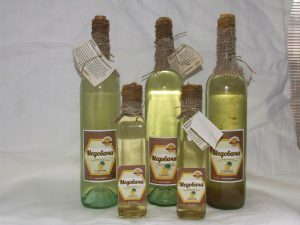 The ‘Soldatović’ honey brandy is a special type of brandy made of double-distilled brandy, honey and propolis, with the addition of medicinal herbs. It has a characteristic scent, taste and colour, which changes depending on a type of honey used for its made. It is packaged in bottles of different types and sizes, to enhance the purpose of the product itself and meet the wishes of our customers. In moderate amounts, it has a positive effect on blood circulation, bacteria and viruses, but it also improves appetite and digestion, which makes it an ideal appetiser. It is consumed cooled. For friends only – the ‘Soldatović’ honey! Honey brandy based on quince brandy is a traditional natural drink. It belongs to the group of liqueurs and has a therapeutic effect. Every bottle of brandy produced by the ‘Soldatović’ Estate is unique, since it is hand-filled and wax-sealed. It is made in a traditional way, according to a centuries-old Serbian method. 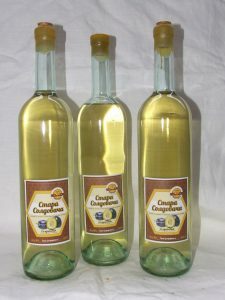 The ‘Soldatović’ honey brandy based on quince brandy is a special-type brandy, made of quince brandy, honey and propolis. It has a characteristic quince scent, taste and colour, which changes depending on a type of honey used for its made. It is packaged in bottles of different types and sizes, in order to enhance the purpose of the product itself and meet the wishes of our customers. In moderate amounts it has a positive effect on blood circulation, bacteria and viruses, but it also improves appetite and digestion, which makes it an ideal appetiser. It is consumed cooled. A fine, healthy drink made of green walnuts and honey. It contains no sugar or preservatives. Walnut brandy is a liqueur made of green walnuts and it is a natural medicament for stomach, mouth and throat mucous membrane. Walnut brandy is a very healthy liqueur, rich in iodine, recommended by doctors as a supplement in cure of thyroid gland problems. It is also known as ‘Orahovac’. Not only is sipping this drink a finest pleasure, but it is generally believed that this product has significant health benefits. This is because of green walnuts, which in development phase contain valuable ingredients (especially iodine, which is frequently missing in daily nutrition). We recommend walnut brandy as a very tasty drink and a healthy appetiser. Unripe walnut fruits, with a soft central part, represent a natural, rich source of vitamin C and iodine, which is why they have been used since ancient times for different preparations that help thyroid gland, particularly in case of hypothyroidism, or underactive thyroid gland. Walnut liqueur can be kept long and, as a rule, it gets better the older it is. It is packaged in bottles of different types and sizes, to enhance the purpose of the product itself and meet the wishes of our customers. 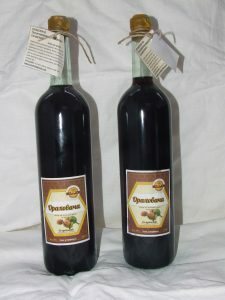 Cherry brandy is a home-made beverage made of cherries, honey and home-made brandy. 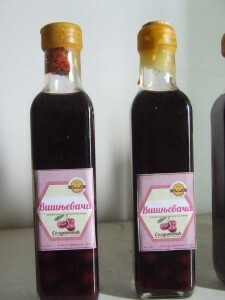 Making cherry brandy was once a regular part of preparation of winter preserved food in many Serbian homes. Today, when a large number of industrial beverages are available, this traditional specialty has almost become forgotten. In addition to water, cherry fruit contains significant amounts of sugar, organic compounds, tannin, pectin, mineral substances, vitamins C, B1, B2, PP and carotene. The latest medical research shows that cherry fruits are rich source of substances with antioxidant and anti-inflammatory effects. These excellent properties are mixed with equally superb, if not even better, characteristics of honey, to which brandy is added to produce an exceptional beverage. 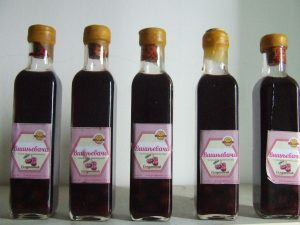 Even those who do not particularly fancy alcoholic beverages are likely to change their minds after consuming the home-made cherry liqueur with honey. 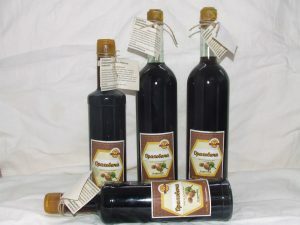 Our plum brandy, we called it Old Soldovaca, is homemade fruit brandy. We made it of plums Pozegaca, grown in our orchard. All plums tree, from which we get the highest quality plums brandy are located at an altitude of over 350 meters above sea level, in an environmentally healthy and clean environment. This variety of plum is known as the highest quality varieties of plums for processing into brandy and it gives a very aromatic and drinking plum brandy. Plums should be left to mature on the branch as long as possible. The fruit must be golden yellow, the skin dark blue almost black. Požegača, ripens in late August or in the first half of September. Only the highest quality, fully healthy and not damaged fruits are picked because they provide the highest quality brandy. The production technology by which we make our brandy is aged for decades, because our ancestors use it, long before us. Our plum brandy and other brandies that we make, we keep in wooden (oak) barrels for better flavor and color (brownish gold). The big yellow, fragrant and pungent, fruit quince are regarded as a symbol of love, happiness, fertility, wisdom, beauty, durability and permanence are ideal for making quince brandy. Brandy obtained from quince is an extremely appreciated drink. Our quince brandy is exquisite aroma and flavor, giving the quince from our own plants ie. plantations. All quince tree, from which we get the highest quality brandy quince are located at an altitude of over 350 meters above sea level, in an environmentally healthy and clean environment. Far more important for making brandy is a medical condition, the degree of maturity and purity of fruit. After reading, sweet and aromatic fruits in their full maturity, access to washing, sorting and then perform cutting or grinding fruit. Cutting to achieve the best possible chopping fruit, but making sure that the seeds are not damaged, as this may cause a bitter taste of brandy. After three months of aging our quince brandy is drinkable, noble taste and with rich aroma.